The process of disposing of our wastes begins with everyone (hopefully!) taking the time to place their refuse into the proper cans. 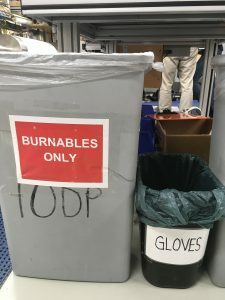 In the science lab areas, there are separate receptacles for burnable waste (like paper), plastics & recyclables (like aluminum cans), and even latex gloves. In the event that we toss something into the wrong bin, it will be sorted before the next step in the process. 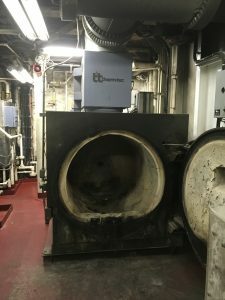 Once all the trash is collected from the small bins around the ship, it’s brought to the stern for processing. We have one (massive!) incinerator for all the burnables, and another incinerator for the waste oil produced from our machinery. The paper incinerator runs pretty much constantly- each cycle takes 3 hours total (1 hour for heating to 1200+ degrees & combustion, and 2 hours for cooling). The ash that’s produced from the burning of the paper products is collected into bags for disposal once we get back to shore. 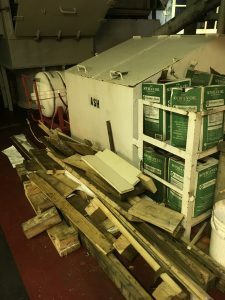 Ash container, lumber collection, and used cooking oil waiting for disposal on land. We also have special repositories for used batteries and electronic waste. We do all we can to keep the environment clean! If you’re an educator, one easy way to get students thinking about the trash that they produce is to challenge them to carry around a bag of their trash for a certain number of days. ALL trash is collected, save for hygiene products and food, since those are very unsanitary. At the end of the allotted time frame, students can sort the trash into paper, plastic, aluminum, etc. and weigh it or tally the number of items. This activity really does make them aware of how much garbage they produce on a daily basis (expand this with calculations for trash produced per week/month/year!) and can lead into valuable discussion about the 5 Rs (Refuse, Reduce, Reuse, Repurpose, Recycle) and renewable vs. non-renewable resources. As I was writing this, I remembered that when I was a little kid, I was obsessed with the garbage men when they’d come by weekly to pick up our trash set at the end of our driveway. Early in the morning, I’d hear the squeaky brakes of the truck and run across the hall to stand on the radiator in order to see out the window and just watch the garbage men. Now, many many years later, I’m curious about the waste flow on a ship in the Pacific Ocean. Maybe I’m in the wrong career field, and should have gone into waste management! THANK YOU to SIEM’s Ian Barnes for setting up the incinerator tour, and Allen Torres for showing & explaining things to us!